The emergency spillway of the Oroville Dam was in danger of failing, and if that happened, devastating flooding was imminent. More than 180,000 residents, including the majority of the city of Oroville, received 60 minutes to gather their belongings and head to safety in the north or higher ground. In the hurried exodus, panicked residents clogged many roads, knowing that whatever they left behind might be gone when they returned—whenever that might be. Thousands of frazzled evacuees landed at Chico’s Silver Dollar Fairgrounds, and as food, clothing, and other supplies rolled in through the community’s generosity, the people whose lives had been abruptly uprooted were understandably out of sorts. Most evacuees needed food, while some required health care and others, especially families and children, just needed a mental escape. In the immediacy and the aftermath, an ad-hoc group of University volunteers stepped up to provide those essentials: food, nursing, and a welcome distraction. 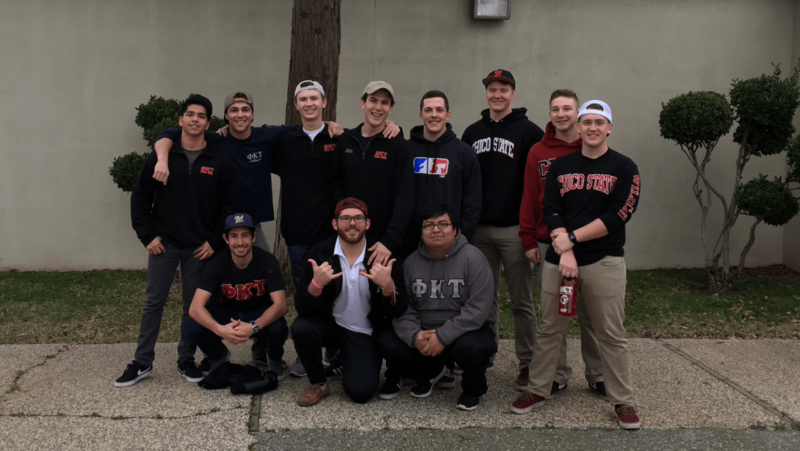 When Chico State student David Chalem saw the news footage of hundreds of people streaming into the fairgrounds evacuation center, Phi Kappa Tau’s philanthropy chairman knew it was an opportunity to help. Members of Chico State’s Phi Kappa Tau fraternity prepared meals for evacuees who arrived at the Silver Dollar Fairgrounds. Fifteen members of Phi Kappa Tau arrived at the fairgrounds evacuation center early Wednesday, and they witnessed what more than two days’ worth of fatigue, uncertainty, and worry look like. After they arrived, Phi Kappa Tau’s members got to work, spending the early morning hours serving breakfast, cleaning and putting away cots, then preparing dozens of lunches in the afternoon. Joined by fellow fraternities Kappa Sigma and Lambda Chi—as well as sorority Sigma Kappa—the young men of Phi Kappa Tau provided much-needed nourishment and lifted the evacuees’ spirits. Just because the evacuation order has been lifted, Chalem said, the work of Phi Kappa Tau isn’t finished. This group, which also works closely with multiple campus events, will soon sponsor a drive at the fraternity house to collect a wide range of items that future evacuees might need. When nursing major Keri Fong saw Oroville residents scrambling to Chico evacuation centers, she too responded by instinct. The graduating senior immediately contacted Peggy Rowberg, director of the University’s School of Nursing, to see how and where she and her fellow nursing students could volunteer. Rowberg contacted Butte County Public Health to see where her students were needed, and they were directed to the fairgrounds evacuation center. “As soon as we were notified, we wanted to dedicate our time and put our nursing skills to work,” Fong said. 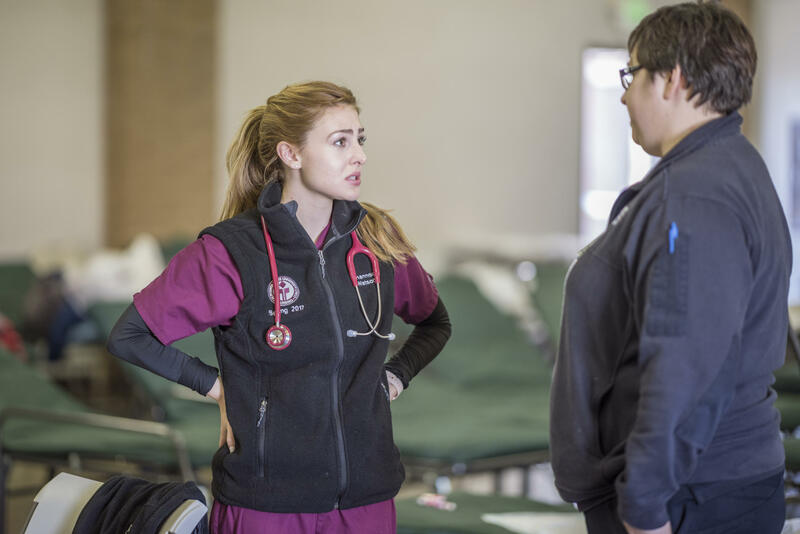 For a few days, Chico State nursing students worked hand-in-hand with Butte County Public Health, with students often spending up to eight hours a day caring for evacuees. CSU, Chico School of Nursing student Shannon Watson put her nursing skills to work at the Silver Dollar Fairgrounds evacuation center. What the students experienced represented a good cross section of real-world ailments, though the environment “was very different from what we’ve learned in the hospitals and clinical rotation,” Fong said. Some evacuees forgot their medications. A few had low blood sugar. Others simply didn’t feel well. The students were also able to provide one of the most important services of nursing: someone who listens. Fong said the students were pushed by the gravity of the situation, which also encouraged the group. “As a nursing student, it felt really rewarding to give back to our community and use what we’ve learned,” Fong said. For evacuees in better health, many wound up on cots at the evacuation center with little to pass the time and overwhelmed with fears about what might be happening or could happen to their homes. The Chico State men’s soccer team wasn’t sure what to offer. 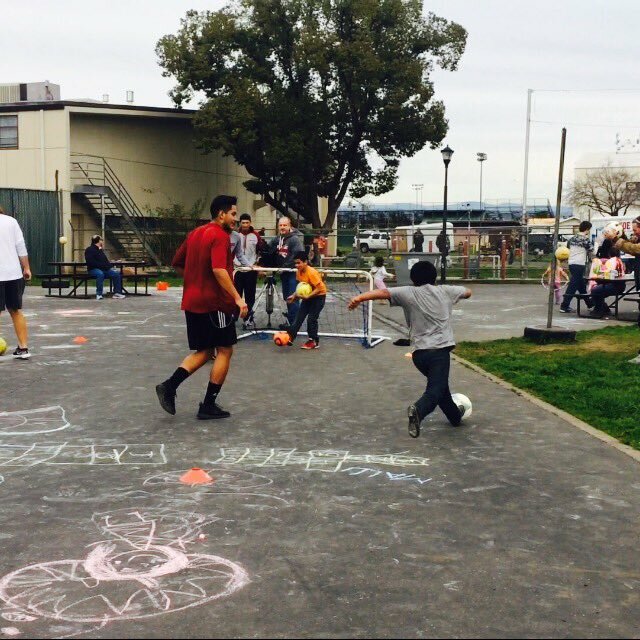 But they mobilized what they had: six mini soccer goals, about 30 soccer balls, and a lot of youthful exuberance. Head coach Felipe Restrepo texted his players to ask if they would forgo their regularly scheduled practice time to instead visit the fairgrounds and see if some kids wanted to kick the balls around. Christian Roman and the rest of the Chico State men’s soccer team brought soccer balls and youthful exuberance to the displaced families at the fairgrounds evacuation center. Roughly 50 to 70 of the children joined them, and they all played until dark. “We saw it as an opportunity to lean into the community and bring some cheer into adverse circumstances,” Restrepo said. Several television crews took notice. The Wildcats’ actions were broadcast on news outlets located from the Bay Area to Sacramento. The students’ efforts were even written about in the Washington Post. Amid the potential for major destruction, players said it was nice to help some building take place. Restrepo wants to make it clear that his team was a small part of a bigger story. In the end, Restrepo believes that his student-athletes received at least as much as they gave from the experience. “This program is about trying to grow winners in family, community, and career,” said Restrepo. “Our motto is: ‘Be a man built for others.’ And to me this was an obvious way for them to see that in action,” he said. Sports Information Director Luke Reid contributed to this report. Sean Murphy (English, ’97) is the Media Relations Coordinator at Chico State. When he's not writing press releases and pitching story ideas to the media or fielding media inquiries, he's writing about human interest stories, sports, the outdoors and the remarkable students, staff and faculty at Chico State.